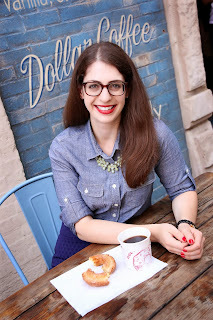 I'm back with my fourth annual list of the best foods I ate this year! 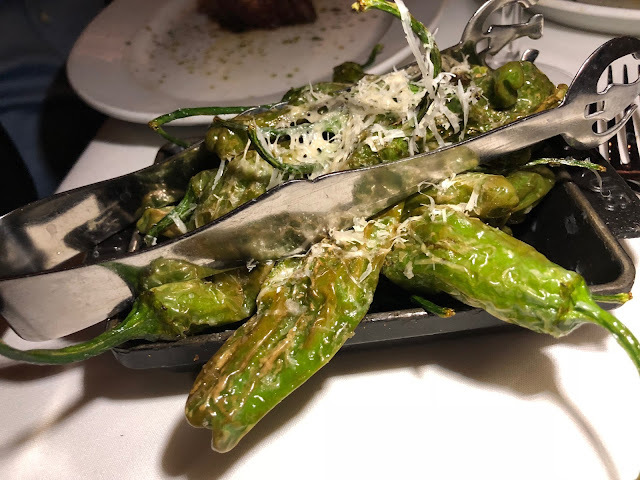 Keeping track of all of the restaurant openings in Chicago is my side gig, and let me tell you, there were at least 10 openings each month (and a slurry of closings, sadly) making it even harder to pick my favorite dishes. 2018 was also filled with domestic and international travel, so you'll find a few of my favorites are not from Chicago. 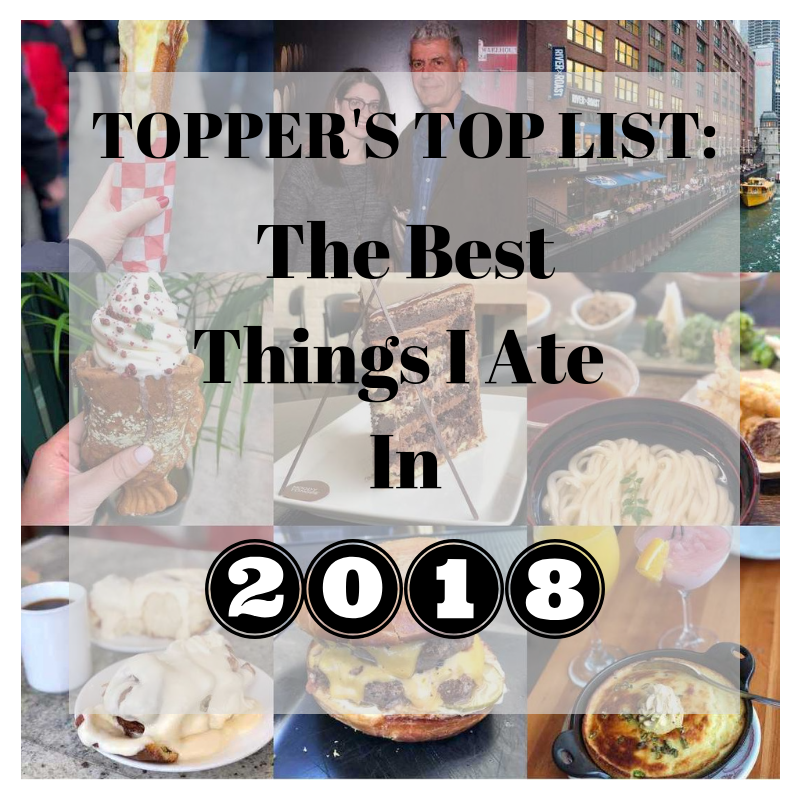 In no particular order, here is my list of the best things I ate in 2018! 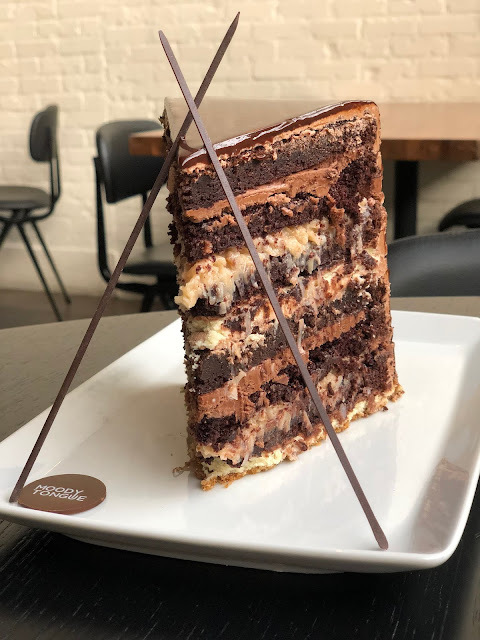 1) 12 Layer German Chocolate Cake at Moody Tongue. Man was this thing DECADANT. After you try it, you have to try making it (and invite me over). 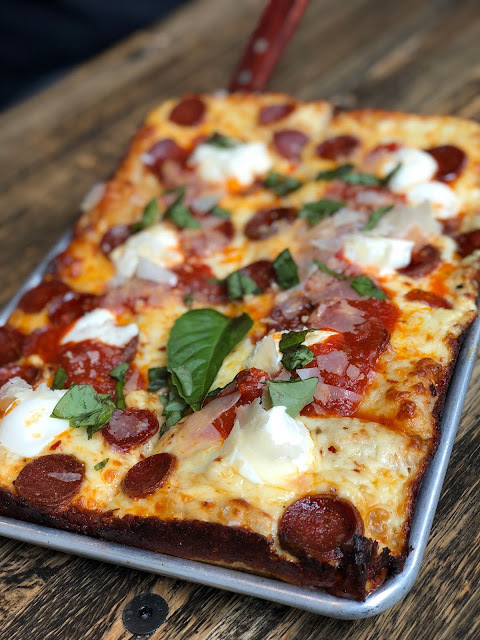 2) The Red Devil Pizza at Longacre. Amazing goat cheese and perfectly crispy corners. Added bonus: they deliver. 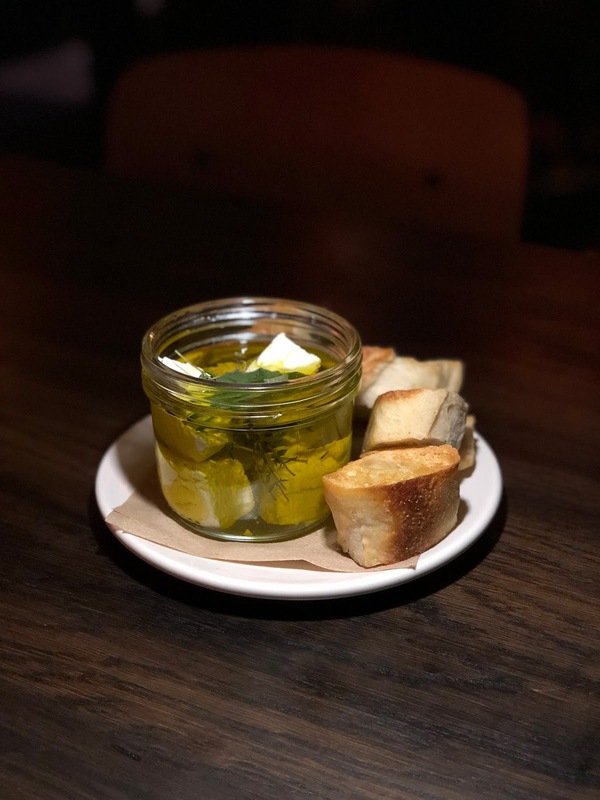 3) Marinated Goat Cheese at Bar Ramone. This was seriously to die for and seriously simple. 4) Matcha and Yuzu Croissant at Supermoon Bakehouse (New York, NY). 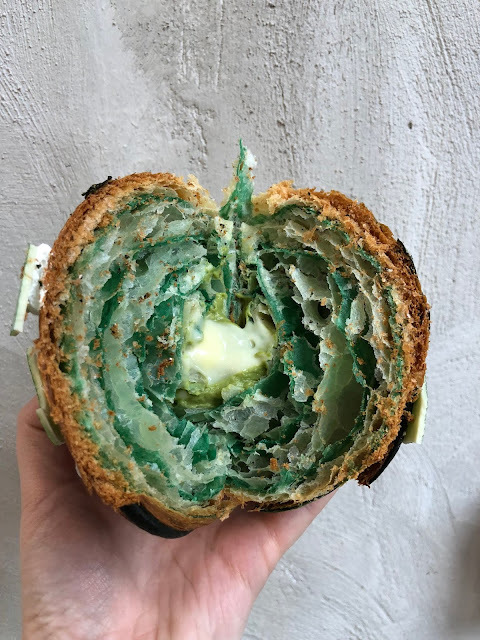 This is an incredibly beautiful croissant and I loved the grassy matcha with the bright yuzu citrus flavor. 5) Coffee and Doughnuts French Toast at 3 Squares Diner. This cozy neighborhood diner made the single best piece of French Toast I have ever tasted. 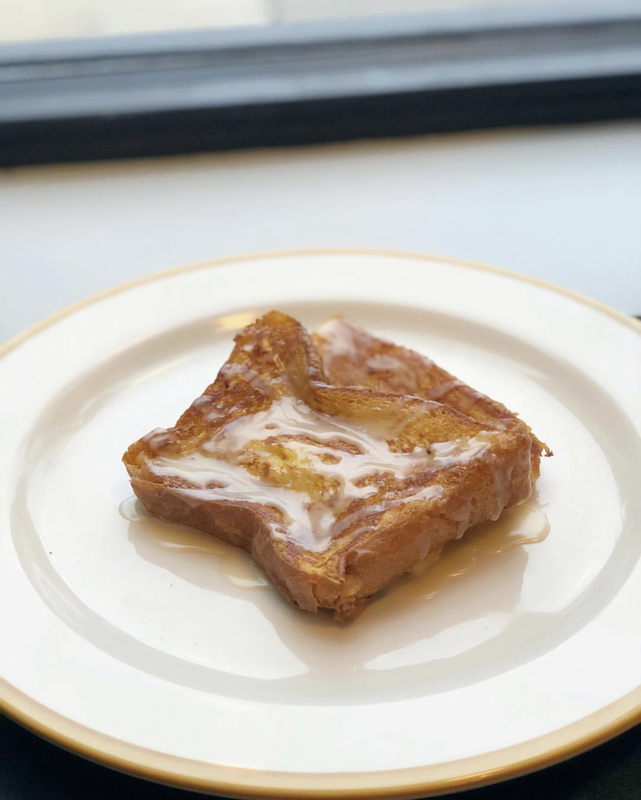 They use coffee in the glaze making it the perfect breakfast. 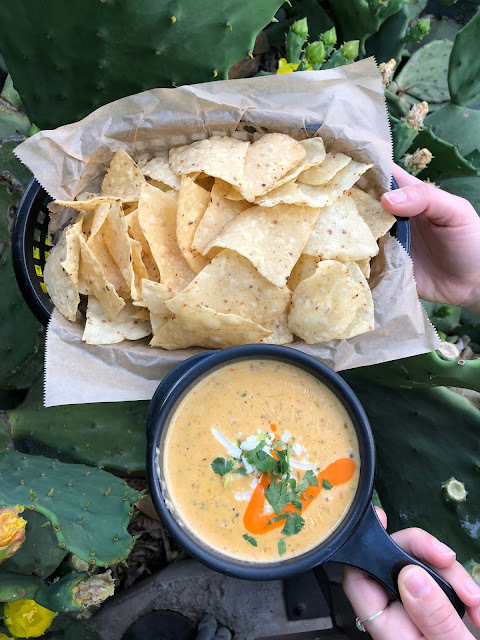 6) Green Chile Queso at Torchy's Tacos (Austin, TX). I'm still looking for this type of queso in Chicago - if you've found it, let me know! 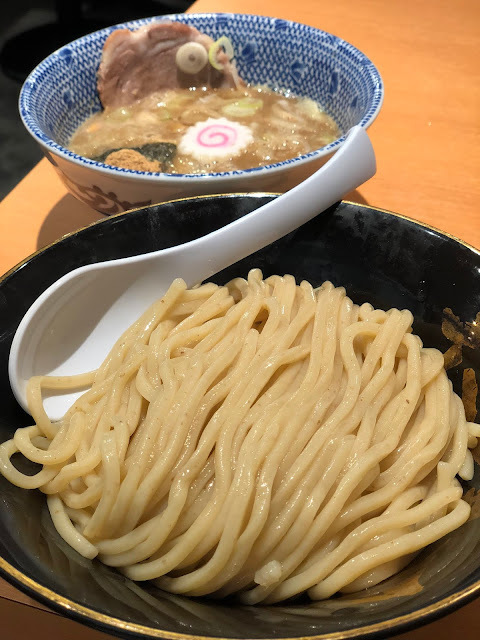 7) Tsukemen Ramen at Rokunrisha (Tokyo, Japan). This style of ramen involves dipping cold noodles in the hot ramen broth. Those fresh noodles were so incredible and have now ruined stateside ramen for me forever. 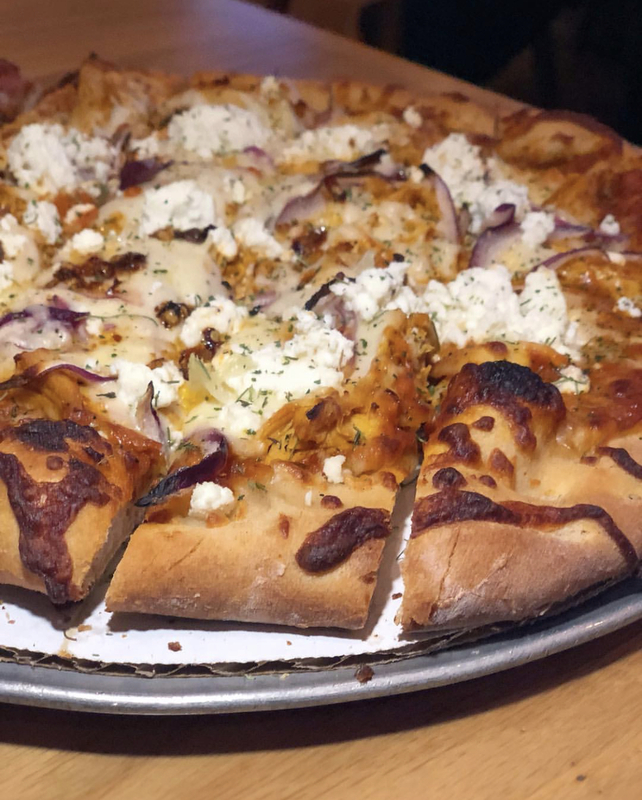 8) Pub Royale Butter Chicken Pizza at Roots Pizza. One of the best collaborations between two Chicago restaurants. What's better than Roots Pizza? Pub Royale's Butter Chicken on top. 9) Squash Mochi with Maitakes and Brussels Sprouts at State Bird Provisions (San Francisco, CA). I fell in love with mochi in Japan and this dish was like eating the perfect mochi gnocchi. 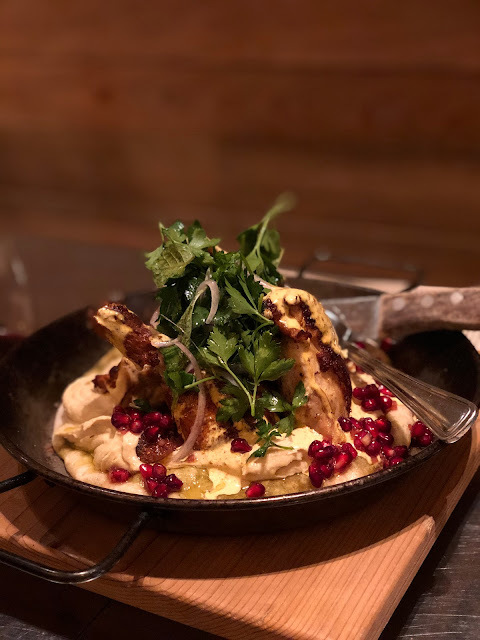 10) Roasted Half Chicken Shawarma with Hummus, Pita, and Pomegranate at Avec. I know what you're thinking -- ordering chicken at a restaurant? Yes, and it was the best decision ever. The combo of juicy chicken, creamy hummus, and charred hearth-baked pita was perfect. 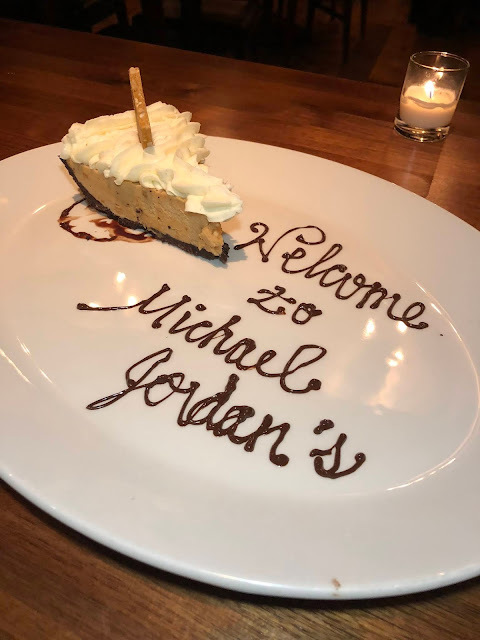 11) Peanut Butter Pie at Michael Jordan's Restaurant. I know most people know MJ's Restaurant for its 23 Layer Chocolate Cake, but it's the Peanut Butter Pie that blew me away. It was hard not to finish the entire slice from the Oreo crust and chiffon filling, to the creamy housemade whipped cream topping. 12) Black Truffle Croquetes at S.K.Y. There are so many excellent dishes at S.K.Y. 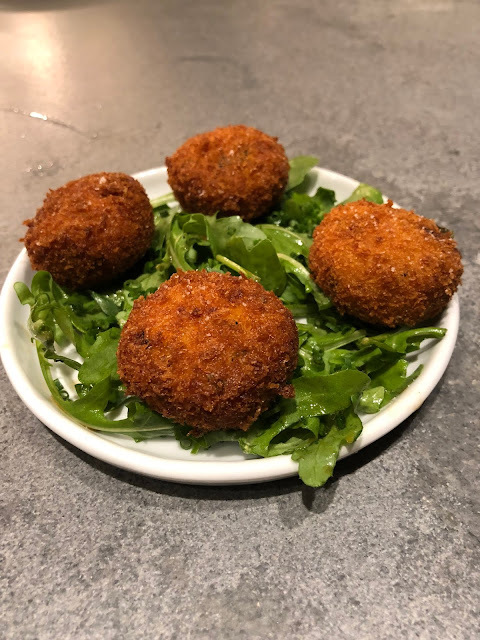 but one item that stood out to me was the crispy and creamy Black Truffle Croquettes with aged white cheddar and jalapeno. I hope you have a happy 2019! What were some of the best things you ate or drank in 2018? Let me just start off this post by saying my meal at Steak 48 was EPIC. From the atmosphere and service, to the food and wine, everything went off without a hitch. 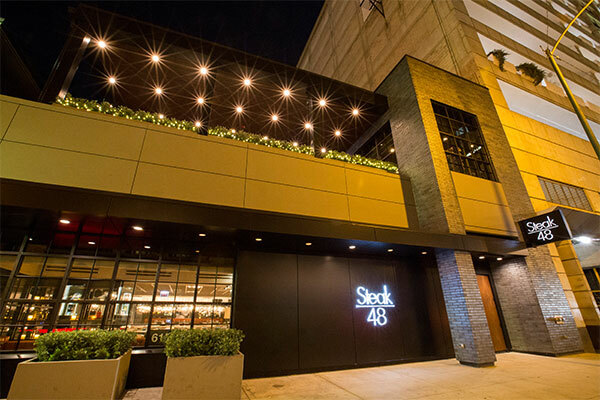 Steak 48 is one of the newer steakhouses to enter the Chicago market, a bold move if you ask me. 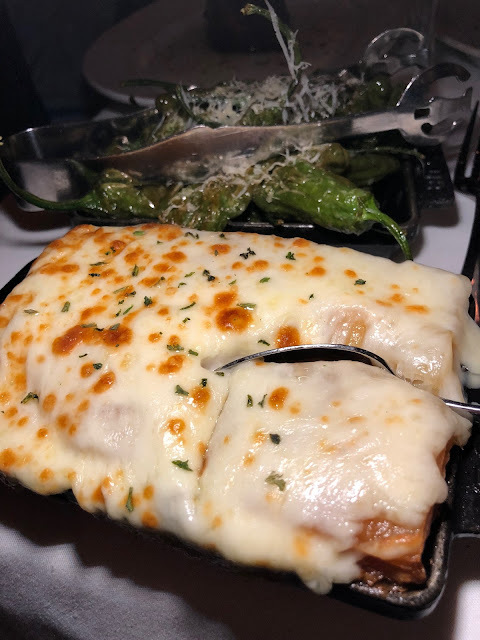 We take our steakhouses pretty seriously here in Chicago, and there is certainly no shortage of excellent options. 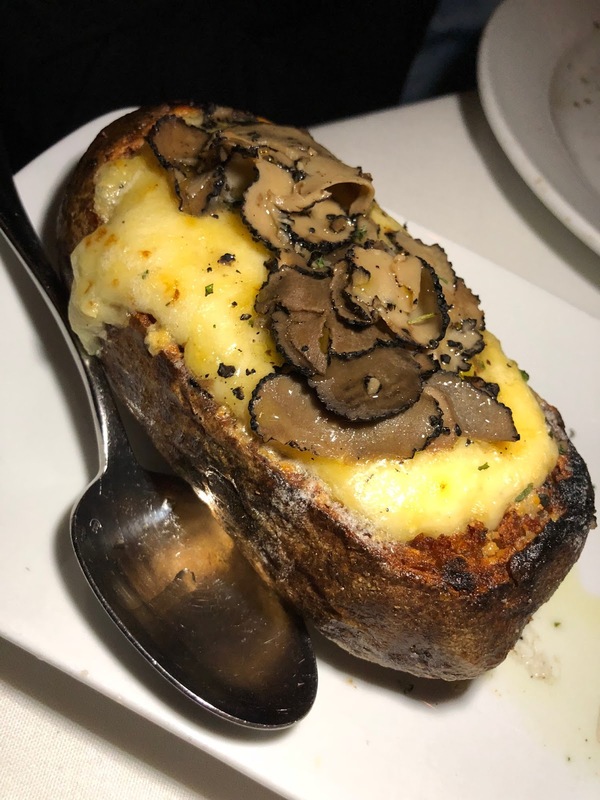 Steak 48 was started in Phoenix by the brother's behind Mastro's Steakhouse. The "48" represents Arizona as the 48th state in the union. The Chicago location is its third (there's also a Houston location). One thing to know about Steak 48 is that the menu is gigantic. Usually that's a red flag, but after eating what seemed like 1/3 of the menu, I can assure you it's not. However, I would recommend dining with a group so you can maximize the number of dishes you can try. The restaurant itself is also gigantic, but on the Saturday evening our party of four dined, the entire restaurant was packed. We were seated on the second floor which also houses a patio (it would be lovely if Chicago actually pretended it was spring). Both floors are made up of separated rooms, so even if it is a busy night, you never feel like it's too crowded. The dining spaces themselves are modern, clean, and add a touch of character with large pop art murals. From the moment we were seated, we know we'd be well taken care of. Our server LaDarian was a true professional. He knew every single detail of the menu and repeated it with enthusiasm, not boredom. 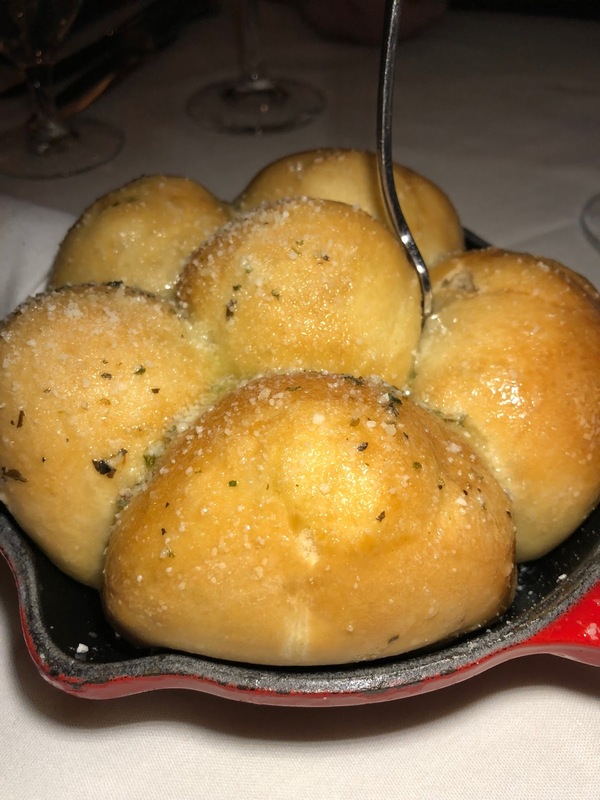 Every meal starts with Steak 48's signature rolls - brushed with butter and Parmesan and pillowy soft in the middle. 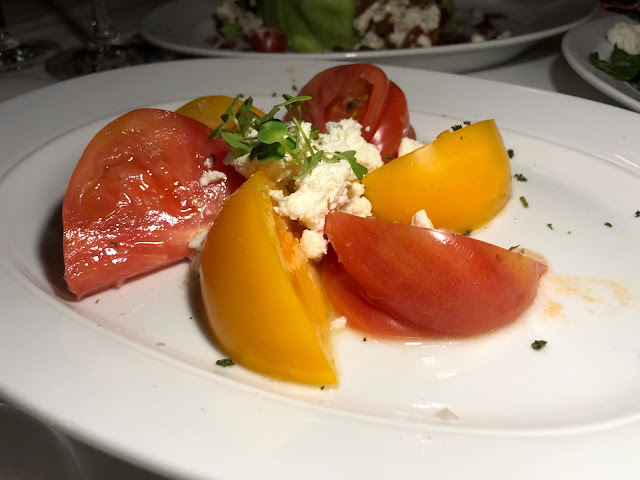 A quick glance at the wine list or dinner menu may leave you dizzy; however, the servers are well-equipped to help with wine and food selections. I will say, the wine list offers a great variety of price points! I recommend having a game plan as we were nearly stuffed after our appetizer course. Nevertheless, we started with a handful of appetizers that were either recommended by our server, or caught our eye. 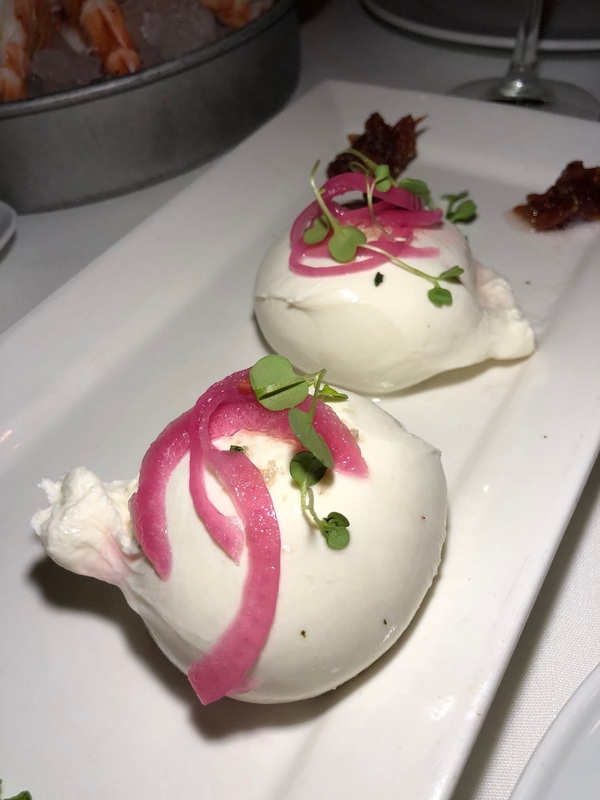 The fresh burrata was outstanding and I could not get over the portion size. You essentially get double the order as a normal restaurant. Each portion is served with pickled red onions, tomato jam, and grilled bread. The freshness and richness was incredible. 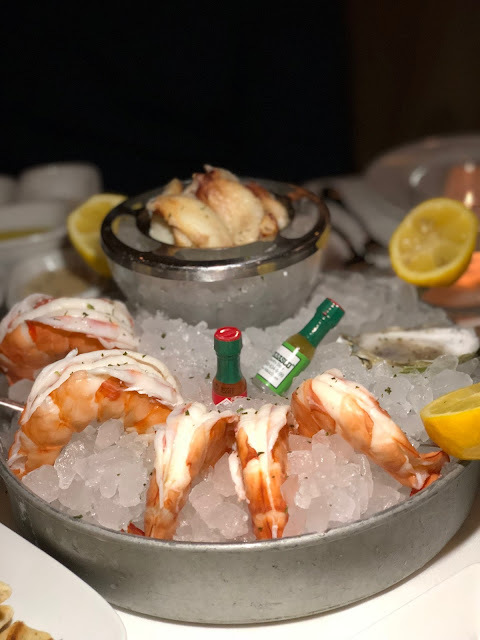 You can't begin a steakhouse experience without a little seafood. LaDarian recommended the dungeness crab cocktail, and the colossal shrimp cocktail was a must. 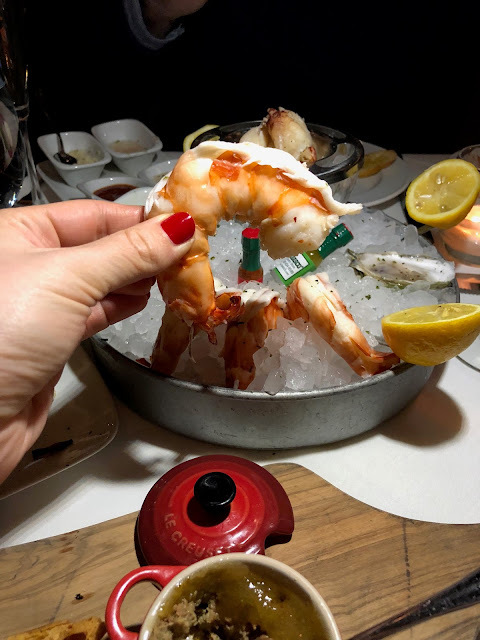 Those shrimp were MASSIVE. I mean, just look at their size compared to the little bottles of Tabasco (and my finger)! At $8 a piece, they should be! The crab cocktail was wonderful too - it was nice to enjoy the succulent crab meat without breaking a single shell. 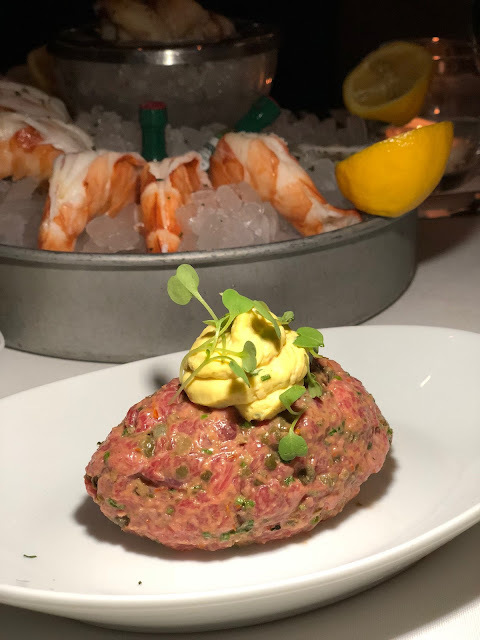 The night we dined, the kitchen was offering a special steak tartare made with domestic wagyu beef. I'd never tried wagyu beef tartare, let alone domestic wagyu, so it was a must order. We loved the richness of the tartare, combined with the creamy whipped egg on top. 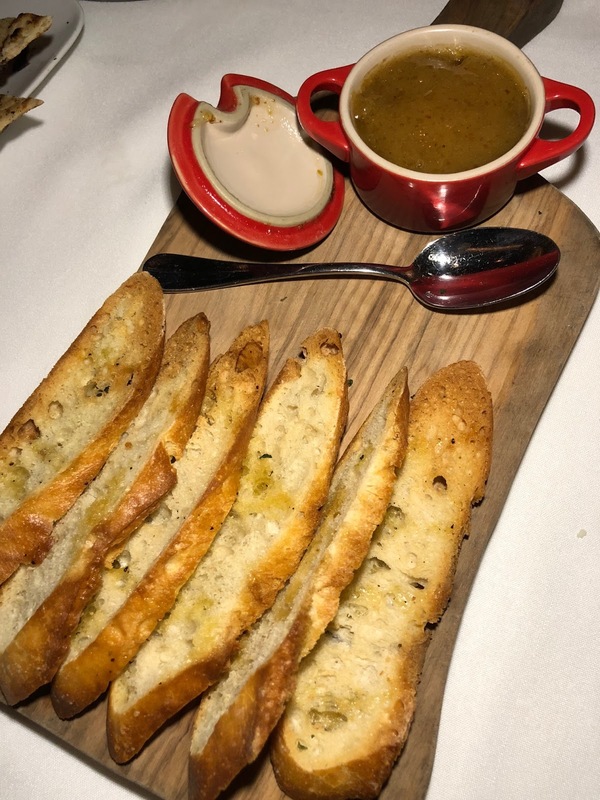 A house favorite appetizer is the Chef's "PB&J" made with pate, bourbon, and fig jam. The spread was nicely balanced between savory and sweet. 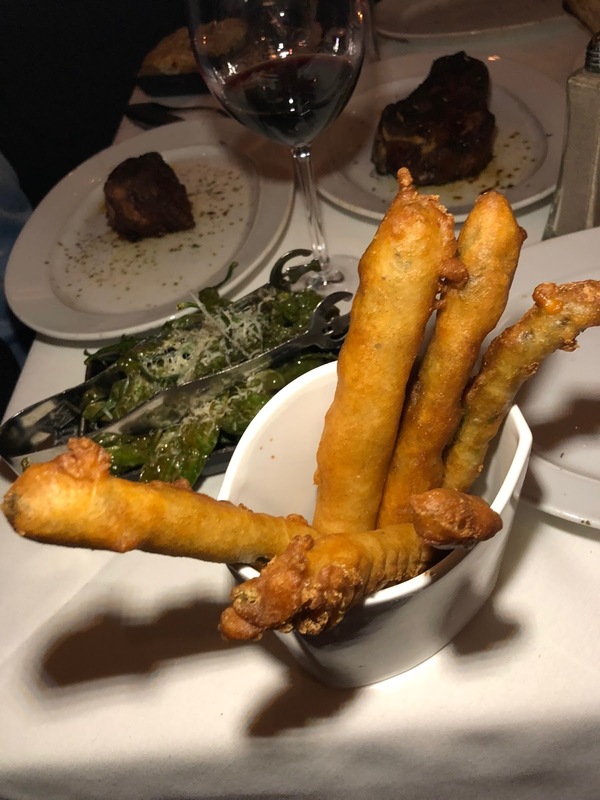 OK, so we may have gone overboard with our appetizer course. 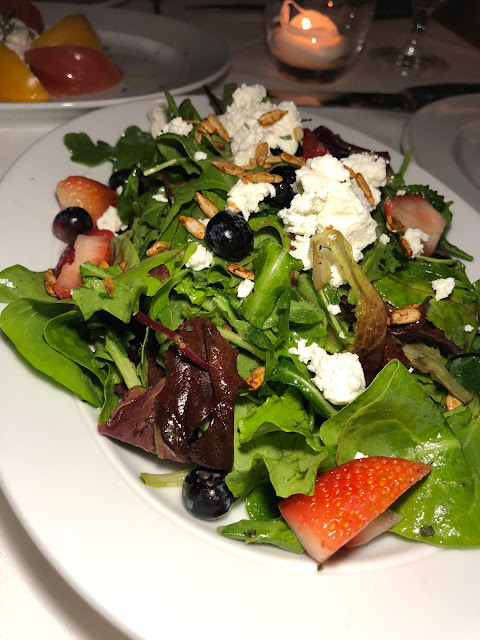 We had to get some greens in before our meat-filled entrees, so we opted for the Heirloom Tomato Salad, Steak Knife BLT Wedge, and Superfood Salad. I kid you not, all three were delicious. 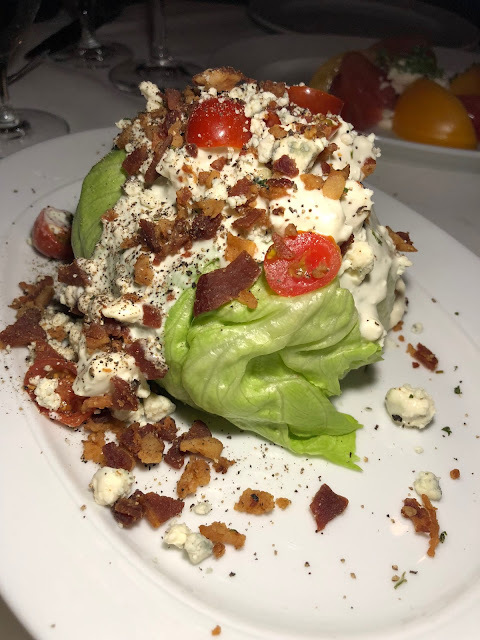 My favorite was the wedge which is every bit of indulgence you'd expect from a salad loaded with blue cheese and bacon! I did really enjoy the champagne fig dressing on the superfood salad as well. We were SO full already, but it was time for us to move on to the main attraction: STEAK! For the four of us, we split a 12 ounce filet mignon, 40 ounce tomahawk, and 18 ounce bone-in Kansas City Strip. Yea, it was a lot. 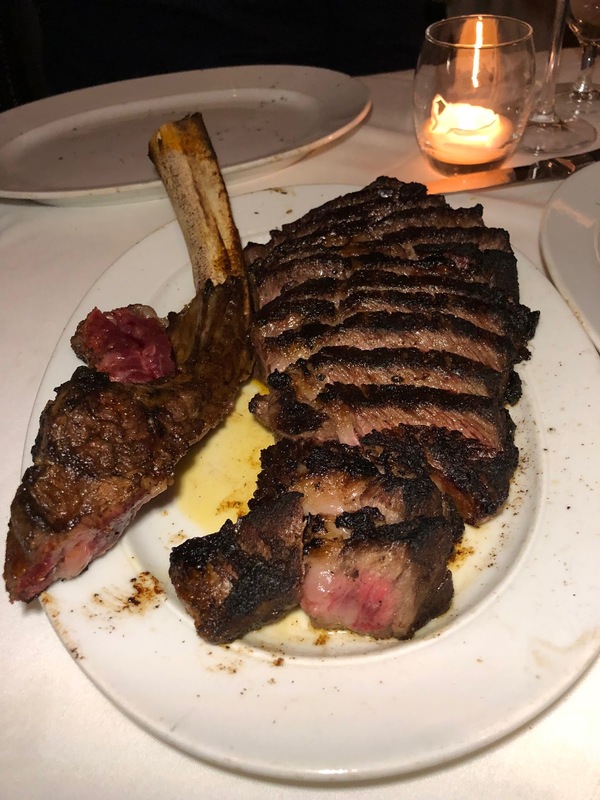 I highly recommend the tomahawk if you dine with a group because it arrives nicely sliced and is easy to share. The steaks were all quite flavorful, if not on the salty side. When it comes to side dishes, you're going to have a hard time deciding. There are 17 options(!). You could easily make a meal of the sides alone. We ordered a few and the kitchen sent out more, so bear in mind I would not recommend ordering this many! 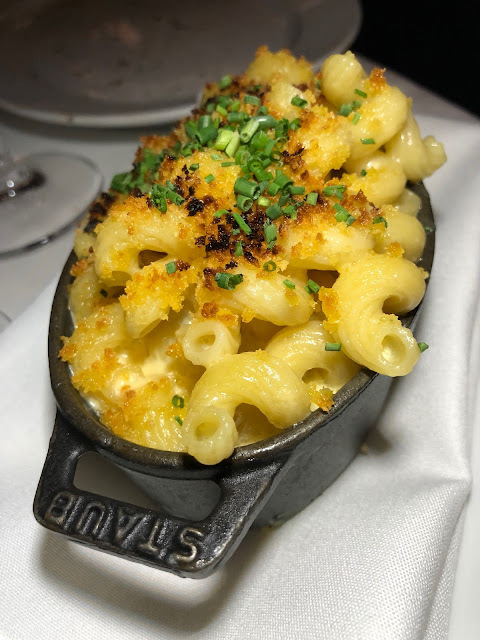 Some of our favorites were the Creamy Mac & Cheese, Au Gratin Potatoes, Double Baked Truffle Potato, and the Corn Creme Brulee (not pictured). We also tried Shishito Peppers and Asparagus Fries dipped in a vanilla tempura batter. At this point in the meal, my pants literally unzipped. Yes, that actually happened. But we came to enjoy our meal from start to finish, and that meant ending on a sweet note. We tried the Brioche Chocolate Chip Pudding with vanilla gelato, and the Chocolate Peanut Butter Milkshake since we are all suckers for anything chocolate and peanut butter. 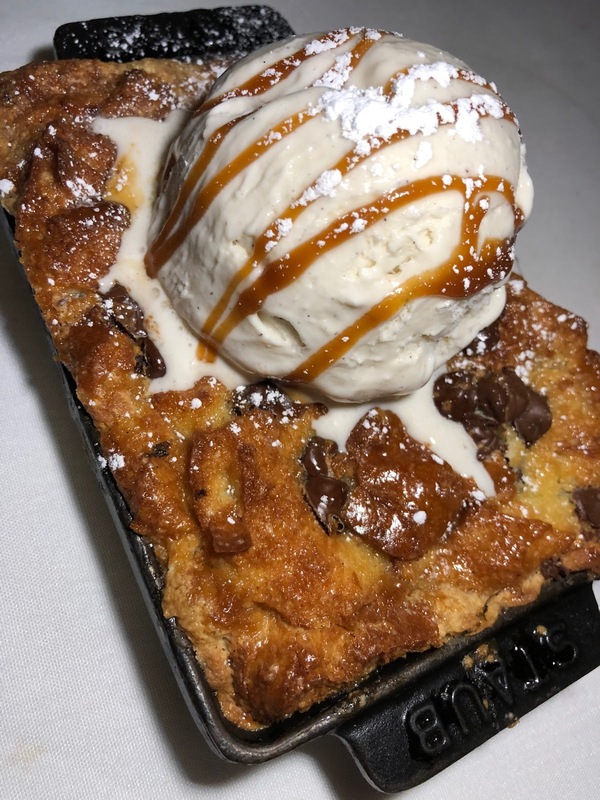 The bread pudding was okay - not amazing, not terrible - but the milkshake was irresistible (and not pictured because we demolished it)! 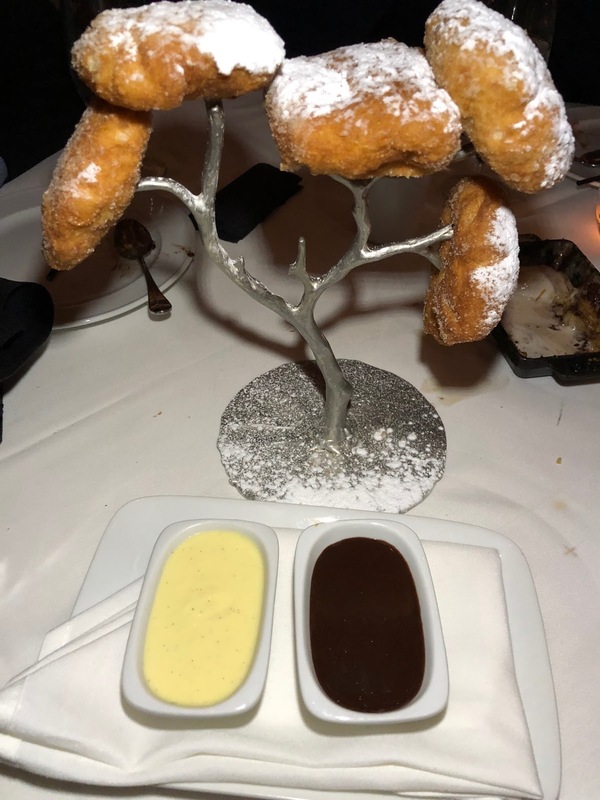 Just when we thought we might burst, a magical Beignet Tree appeared at our table. Each fried pocket of dough was piping hot and paired with vanilla and chocolate dipping sauces. They were the perfect sweet indulgence to end our meal. Our meal at Steak 48 was a fantastic and filling dining experience and we found the staff to be hospitable and knowledgeable. Given the sheer size of Steak 48's menu, everyone in your party is bound to find something they like, meat eater or not. I think that's one of the things Steak 48 does so well - they are able to satisfy traditionalists and modern eaters alike. 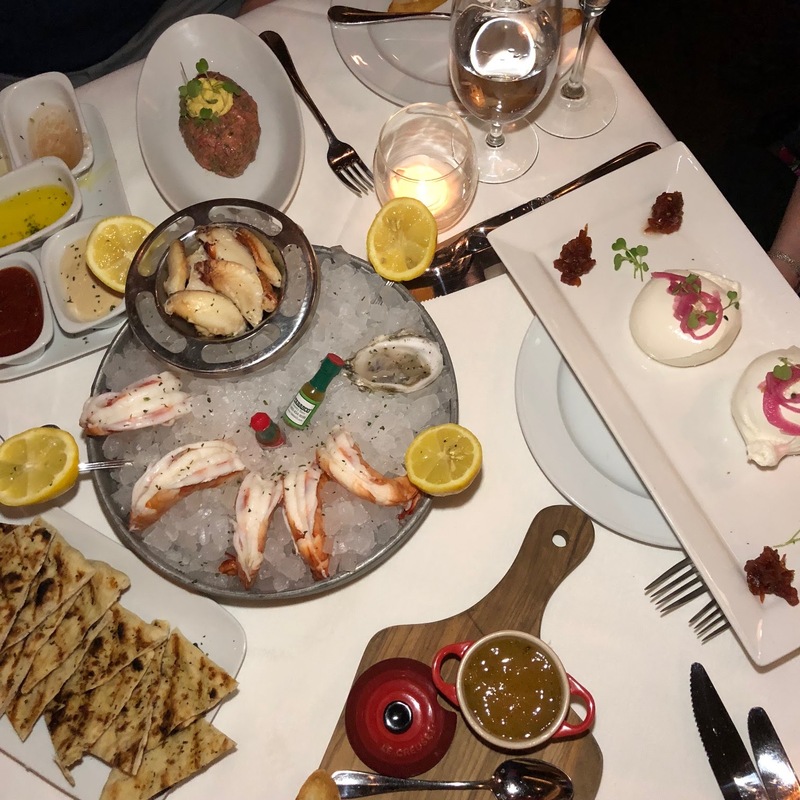 If you're looking for a relaxed yet modern steakhouse experience, I highly recommend an evening at Steak 48. 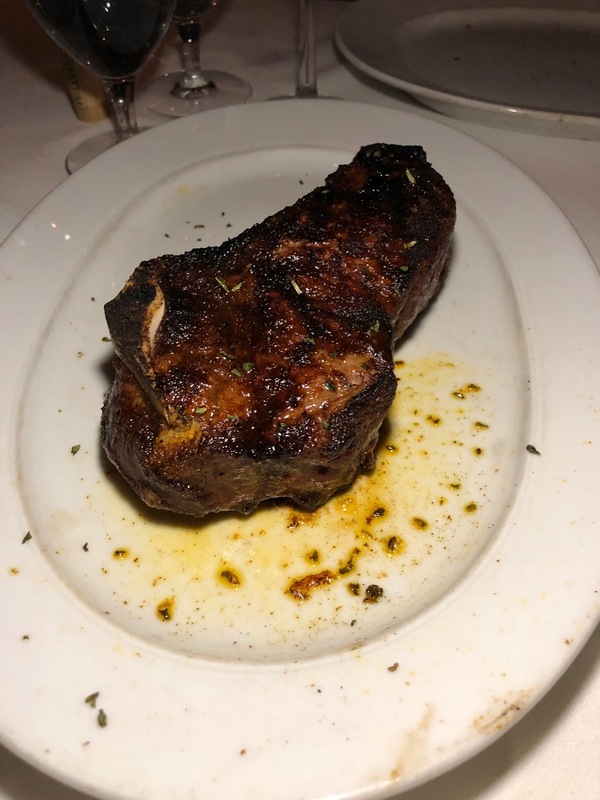 Note: my meal at Steak 48 was complimentary; however, all opinions expressed are my own.